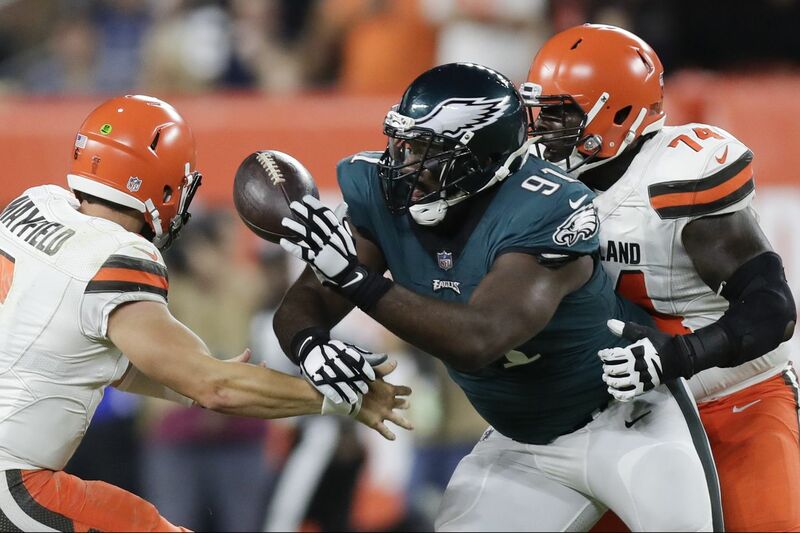 Philadelphia Eagles defensive end Fletcher Cox knocks the football away from Cleveland Browns quarterback Baker Mayfield past offensive guard Chris Hubbard during the first quarter of Thursday's preseason game. 1. The Eagles are in trouble if Carson Wentz, Jason Peters, Alshon Jeffery, Nelson Agholor, Jay Ajayi, and Darren Sproles aren't ready for the season opener. In other words, the first-team offense's performance must be taken with a heavy dose of salt. It seems every year some get caught overvaluing the preseason. I've fallen victim to it myself. Sam Bradford completed 10 of 10 passes against the Packers in 2015 and the Eagles were suddenly Super Bowl contenders. A year ago, Wentz and the offense failed to generate any momentum after the first two preseason games and there was mild panic. Would Doug Pederson prefer for his unit to effortlessly move the football and score touchdowns? Absolutely. Is he worried about the offense, especially if quarterback Nick Foles must open the season as the starter? Maybe a little. But the preseason is meant for working out kinks. It's a trial run. Pederson didn't game-plan for the Browns. He didn't dig deep into his playbook. He's hiding the new stuff. And he was without five starters. To no surprise, he said that he won't play his first unit in the fourth preseason game. Would it be nice to see the offense score a touchdown — just one! — before the regular season? Sure. But there's a risk in playing the starters one series against the New York Jets. Possible injury, yes, but what if they don't score? Rest the players and start preparing for the Falcons on Sept. 6. The opener will be here soon enough. 2. Nick Foles isn't better than Carson Wentz. Well, yeah. That headline is for talk radio hot takers. There was likely never a scenario in which Foles would supplant Wentz this season, even if he were to win every game he started and Wentz were to lose a few upon his return, however unlikely. The Eagles know how to evaluate quarterbacks. Foles is one of the best backups in the NFL, a possible starter for some teams. He hasn't played well the last two weeks. No argument there. But on Thursday his left tackle had trouble protecting his blind side, his running back fumbled when the offense was finally moving, and both players — along with a handful of others — won't likely be on the field if Foles happens to open the season as the starting quarterback. Which is still a possibility with Wentz not yet cleared for contact. Foles is streaky. I wrote about it last week. He needs time to warm up. He needs the scheme to be catered to his preferences, more than many starting NFL quarterbacks. He completed 13 of 17 passes for 127 yards and had several nice throws. His best moment — when he tripped in the end zone, fell to one knee, bounced up, and threw for a first down — was overturned by a review and ruled a safety. But Foles had three turnovers. He had two interceptions — an underthrown pass to receiver Mike Wallace in which he might have been hit as he threw, and an ill-advised toss to tight end Zach Ertz when he simply didn't see the linebacker underneath. The Eagles should know this coming week whether Wentz has any shot of starting in the opener. If they don't by Sunday, they'll begin preparing for Atlanta with both quarterbacks. But Thursday only illuminated the importance of getting Wentz back as soon as possible. 3. Big V has had a big setback. One game is a hiccup. Two games are a trend. Three straight games of substandard play and Halapoulivaati Vaitai could be out as the swing tackle. He's not quite there yet. Vaitai has a proven track record of success. He didn't block well against the Browns, but Myles Garrett is a stud defensive end in the making. Even Peters may have had some problems against the former No. 1 overall draft pick. But Vaitai is clearly struggling with his technique and confidence. I'm no expert, but Eagles offensive line coach Jeff Stoutland has talked before about Vaitai's getting too high in his stance, particularly when he takes a deep vertical set. That extra space gave Garrett an even longer running start. And with his power he either drove Big V back or tipped him to one side. Like quarterback, the Eagles' left tackle problems will likely be solved when the starter plays, and Peters is slated to be ready by the opener. But he's 36 and coming off major knee surgery. He has played 16 games in a season only five out 13 seasons. The odds are that Vaitai — whether it's for Peters or Lane Johnson — will have to play at some point this season. Eagles offensive tackle Halapoulivaati Vaitai struggled against Browns’ defensive end Myles Garrett on Thursday. 4. The starting defense is about as ready as it needs to be. If the struggles on offense aren't to be overblown, then the potency of the defense isn't to be overstated, as well. The Browns aren't exactly the greatest measure of success, and when the Eagles did face a top quarterback in Tom Brady last week, they weren't as sound. But the first unit did hold the Browns to just three points in nearly a half of football and got standout moments from key members. Defensive tackle Fletcher Cox had a sack and blew up several other plays. He's having a great preseason. Defensive end Derek Barnett flashed on a few rushes. The same goes for defensive tackle Haloti Ngata, who had been silent for most of the summer. Defensive ends Chris Long and Michael Bennett had tackles for loss. Linebacker Jordan Hicks may have performed the best. He broke up a red zone pass and recorded a sack with an A-gap blitz. If he returns to his 2016 form, the Eagles defense will be that much better. Linebacker Nigel Bradham and cornerback Jalen Mills missed tackles, but they also had rebound moments. The secondary forced quarterbacks Tyrod Taylor and Baker Mayfield to hold the ball longer than they would have liked. Jim Schwartz dialed up several effective blitzes. His group is ready. 5. The slot corner and weakside linebacker jobs are nearly taken. Sidney Jones started in the slot and played every nickel snap with the first unit. The Browns didn't go at him often, but when they did he didn't falter. I think the job is his and it would have taken a dreadful outing to lose it to Avonte Maddox. The rookie corner missed an early tackle with the second unit, but he also snagged an interception — and was a shoestring tackle away from scoring — and broke up a pass. He's right there in the conversation and could still play based on matchups. But Jones, as I wrote in my column off the game, has far too much talent for the Eagles not to allow him to learn on the job. At weakside linebacker, Kamu Grugier-Hill got the starting nod ahead of Nate Gerry, who filled that role in the first two preseason games. I don't think either hurt his chances, but Grugier-Hill, in my estimation, has been the stronger of the two since training camp started a month ago. 6. It's down to Wendell Smallwood and Josh Adams for the Eagles' fourth running back spot. Matt Jones isn't going to make the 53-man roster. The former Redskin has had far too many miscues. Fumbling was a problem in Washington and was again in the second quarter, when he couldn't secure the ball after a catch. Smallwood (12 carries for 53 yards and two catches for 14 yards) got the start and he ran with effort. He always does. But the Eagles couldn't rely on him in his first two seasons, whether it had to with health, preparation, or ball security. He would be a more-than-serviceable fourth back, but is there upside? Adams appears to have more potential, and that is often what you want out of deep roster spot. The undrafted rookie has been dealing with a foot injury, so his limited number of snaps may have had more to do with the injury than anything, but when he got the ball (four carries for 33 yards, two catches for minus-1 yard) he mostly made positive things happen. Donnel Pumphrey, who hasn't played in the preseason because of a hamstring injury, has one more game to make an impression. Time is running out. 7. DeAndre Carter is making a push for a roster spot. I don't know whether the Eagles plan on keeping six receivers. The top five spots — to Alshon Jeffery, Nelson Agholor, Wallace, Mack Hollins, and Shelton Gibson — are seemingly set. Carter has emerged as the top contender if the Eagles are to retain six. Markus Wheaton would have been my choice early in the summer, but he's been sidelined by a hamstring injury, as well. Carter has done nothing but make plays since the Eagles signed him early in camp. He has a knack for getting open and picking up yards after the catch. Is his size (5-foot-8) a liability? Yes, especially when his special-teams contributions would be limited to returning — and the Eagles already have returners. Does he have great upside? Not really. The Eagles kept Gibson last season and didn't dress him early because they saw potential. He was also a draft pick. Carter has done enough to make the team. It will just come down to numbers at the other spots. The practice squad looks like a more realistic landing spot. 8. There were a few bright spots farther down the offensive line depth chart. Isaac Seumalo played four positions Thursday. He stepped in at center when Jason Kelce briefly left with a back tweak, at guard when Stefen Wisniewski took a break, and at tackle when Vaitai needed rest. He also was the tight end in the Eagles' jumbo package. Seumalo's versatility — as I've written the last few weeks — guarantees him a roster spot. But he has blocked well all summer and appears to have corrected some of the problems he had with the shotgun snap. Guard Matt Pryor has regressed, but that's to be expected for a sixth-round rookie. He has tools to work with. Tackle Jordan Mailata has made great strides. His talents are raw, but there's more than enough there, and his development in three short months has warranted the Eagles' seventh-round gamble. He'll be on the roster as a project. 9. The last few defensive line spots are still undecided. Bruce Hector has the apparent edge on Elijah Qualls and Aziz Shittu if the Eagles are to keep only four defensive tackles. For the second straight week, the undrafted rookie was ahead of both in the rotation and took first-team reps. I don't know what to make of rookie Josh Sweat. He certainly looks the part. He has explosiveness. But he really hasn't stood out. Sweat still walks with a limp. Maybe he's an injured reserve candidate. Can the Eagles afford to trade Steven Means if Sweat isn't ready? 10. And some leftovers … Jake Elliott's short kicking problems continued. A week after he missed an extra point, he hooked a 33-yard field goal attempt wide left. Elliott was clutch last year, but his problems with 30-something-yard kicks date back to college. Will they go away? … Cameron Johnston averaged 44.8 net yards on four punts. Barring something unforeseen he'll be on the opening day roster. … If the Eagles are to keep four tight ends — in light of Richard Rodgers' knee injury — it won't be Billy Brown. He didn't play a single snap on offense even with Joshua Perkins out with a concussion.